During product development, mechanical engineers are often charged with designing the framework and working parts of a product, while the electrical team focuses on components and wiring to connect everything together. When designs change, the wire pathing often has to be reconsidered as well (leading to several design iterations). Therefore, it is important that mechanical and electrical design teams are working from the same information and talking the same language. Electrical Engineers are concerned with how electricity transmits energy. Thus, they speak in terms of circuits and signals. To communicate clearly and understand their objectives, it's important to know basics like the difference between an AC circuit and a DC circuit, general rules of thumb to follow when it comes to American wire gauges and how electrical components like switches, wires, and contacts are illustrated and annotated on a print. These are all ways Electrical Engineers explain components of a project. By knowing general electrical symbols and common tag schemes, it will help teams communicate complex schematics to their counterpart. Similarly, Mechanical Engineers wish Electrical Engineers knew a thing or two about design efficiency, unit cost and development time. Having a basic understanding of how tightly or loosely coupled designs can affect a subsystem is the first step to optimizing the manufacturing process. If Electrical Engineers don't know the implications of tolerance or why it matters when minimizing development costs, it will be challenging for both branches to work toward a common goal. 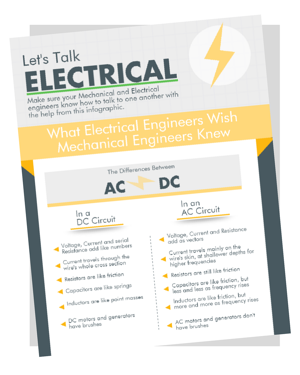 Download our infographic for the complete guide for talking electrical.